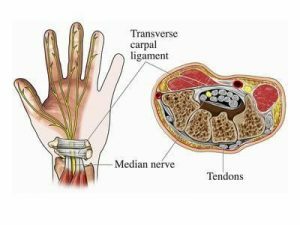 Carpal Tunnel Syndrome is a common condition that is caused by compression of the median nerve as it travels through a narrow passageway in the wrist, which is formed by wrist bones on the bottom and a band of connective tissue on the top. Repetitive gripping over a sustained period. Swelling after a wrist sprain or fracture. Wrist positioned frequently in extreme extension or flexion (forward/backward). Arthritis in the wrist can cause narrowing of the tunnel. Fluid retention during pregnancy or menopause can cause pressure on the median nerve . Symptoms that occur during pregnancy usually resolve afterward. 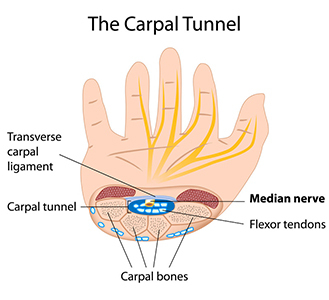 Many people have a predisposition to carpal tunnel due to an anatomically small carpal tunnel. Conditions that are known to damage nerves, such as diabetes. Numbness, tingling, burning and/or pain in the thumb, index, middle and ring fingers, especially upon waking. Symptoms can be worse at night, or upon waking, due to sleeping with wrists bent forward. Pain or tingling that may travel from the wrist up the forearm, and even to the shoulder. Weakness or clumsiness in the hand, causing frequent dropping of items or difficulty with coins and buttons. Symptoms typically come and go at first, then they happen more often until they are happening all the time. The dominant hand is usually affected first. If left untreated, the muscles in your hand may atrophy and you will lose some of your hand function. Recommend and fit the appropriate splint to decrease your symptoms. Assess your daily tasks and recommend changes to allow your nerve to heal. An individualized exercise program will be devised to fit your symptoms and your functional use requirements. Myofascial massage to promote healing. Your physical/occupation therapist will address your posture, with stretches and exercises, as it affects your nerve irritation and healing, since the median nerve travels from your hand all the way to where it connects to the spinal cord at your neck.